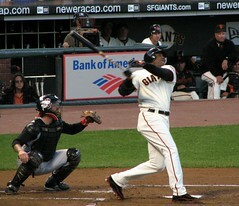 Today’s subject is the all-time Home Run King, Barry Bonds and his signing habits. In 1986, when he first came up to the major leagues with the Pittsburgh Pirates, he was a great signer. I probably got his signature on ten or more occasions. He was always talkative and pleasant. As time went on, he became more and more challenging for collectors. After he went to the San Francisco Giants in 1993, he became more difficult. By the 1996 season he was next to impossible unless he was being paid. In all honesty, I found him to be one of the most rude, sarcastic celebrities I have ever seen interact with fans. I heard him tell a 12 year boy to “F… off” after a Los Angeles Dodgers game, when the boy had the nerve to ask him for an autograph. To sum this up, if you ever encounter Mr. Bonds beware. Ask him for his autograph at your own risk! If you would like to check out my on line store you can at www.autographedfirstdaycovers.com. This entry was posted in Uncategorized and tagged 8x10, Antiques and Collectibles, Barry Bonds, baseball, baseball signatures, Celebrity, Collecting, Dodgers, Grand jury, Hall of Fame, HOF, Jury, Los Angeles, mlb, National Baseball Hall of Fame and Museum, Obstruction of justice, Photo, Pittsburgh Pirates, san francisco giants, Signatures, Sports, steriods, Verdict, Willie Mays, Willie McCovey. Bookmark the permalink.